French police and Nantes Football Club confirmed Sala was on aircraft which lost contact near Casquets lighthouse at 8.30pm. Premier League footballer Emiliano Sala is feared dead after his private aircraft vanished over the English Channel last night. Cardiff City Football Club chairman Mehmet Dalman this morning said he was 'very concerned' for the Argentine striker, who left Nantes in France yesterday evening to head to Cardiff, where he was due to report for training this morning. 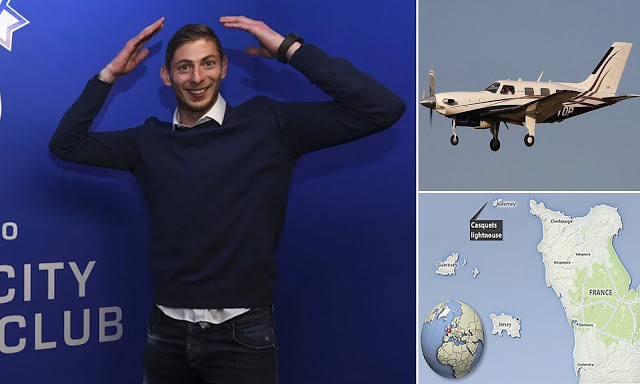 French police, the French civil aviation authority and Nantes Football Club today confirmed that Sala was one of the two people on board the Piper Malibu which lost contact near the Casquets lighthouse more than 12 hours ago. Cardiff City announced the signing of the Argentinian striker from Nantes in a club record fee of £15million on Saturday and Sala had returned to France to say goodbye to his old teammates. He posted a poignant photo on Instagram saying his 'last goodbye' just hours before his plane went missing. An air and sea search has been launched in the Channel Islands for the light aircraft which lost contact at 8.30pm yesterday evening, as severe weather warnings about snow and ice were issued across France. Nantes have announced their French Cup match due to be staged tonight against L'Entente Sannois Saint-Gratien has been postponed in agreement with the French Football Federation.